This is the last of my detailed posts dealing with the shades of the very popular Admiral Issue of 1911-1928. The 50c value has four major listed shades in Unitrade, which are not too difficult to distinguish, while the $1 has three. However, one of the difficulties that collectors will encounter when trying to sort their stamps is the fact that there are several sub-shades within many of the major shade groups that may lead to mis-identification for those who are not familiar with the characteristics of the major shade groups. Like all my other posts on this topic, I will show you examples of stamps from each major Unitrade listed shade group and will then cross-reference the shade names in Unitrade, with shade names from the Stanley Gibbons colour key, modified as necessary when the shades are lighter, darker, brighter, duller, paler or deeper than the Gibbons Colour Key swatches. Unfortunately, my colour key does not have very many black swatches, so most of the names that I give for the 50c shades will be my own, or will not differ from Unitrade in the case of the silver-black shade. The name given to the most common shade, the black brown is completely wrong, as this stamp is a variant of grey-black, and is not brown at all. The black is pretty distinct, but as we shall see, it varies in both tone and intensity. The black stamps are generally from the first printings made before 1914, and will have the same paper and gum characteristics as stamps of that period. This characteristics generally are clear yellowish shiny gum and either coarse or fine vertical mesh being clearly visible in the paper. The silver black is also very distinct, but requires some experience to identify. Again, paper and gum can prove invaluable as an aid to identifying this shade because it comes from printings made in 1917. The 1917 paper has less visible mesh and has smooth cream gum, with a satin sheen. Unitrade places a 1923 date next to the brown-black shade, but in reality, this shade is a catch-all group for all the common wet printings that are neither the pure black, nor the silver black. These of course, can come from any year between 1912 and 1925. The above stamps are both examples of the basic dry printing. This is the most common printing in which the mint stamps of this value are found. 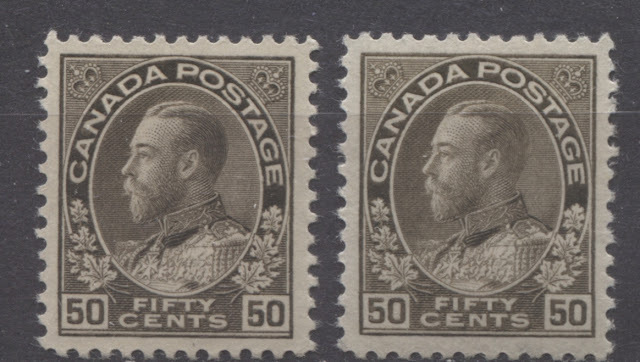 All of the dry printings have the re-touched frameline in the upper right spandrel, which I have discussed in a separate post: http://canadianphilately.blogspot.ca/2016/03/the-die-types-on-admiral-issue.html. As you can see, while both these stamps have a hint of brown, they are not brown overall, but are really a variation of grey black. The stamp on the left is thus brownish grey black and the stamp on the right is pale brownish grey black. The above stamps are all examples of the Unitrade listed black shade. As you can see, there are some subtle nuances in the shade, with the first two stamps being a pure black and the third stamp being more of a charcoal shade, because of the greyish cast that it has. Lastly, the stamp on the right is a more intense black than the first two stamps. These three stamps are all examples of the scarce silver-black shade from 1917. Hopefully you can see the clear silvery cast that this shade has. Brownish grey black dry printing - Unitrade's black brown. Hopefully this will make it much easier to see the different shades. They really are quite distinct and not too difficult to identify once you are familiar with them. This is not too difficult a stamp to sort, but most collectors will find that the dry printing is far and away the most common, with probably as many as 80% of examples they come across being dry. The wet printings when found, are usually an unmistakable, deep, rich reddish orange. As we shall see, there is really no true brown orange, but just brownish orange. The brownish tinge is fairly easy to see once you know what to look for and are familiar with the basic orange shade, but at the same time it is very easy to classify it as just the basic orange dry printing if you are not familiar with it. In addition all three of the listed shade groups have variations within them. Light bright orange - similar to bright orange, but with a hint of white added to the colour. These three stamps are all examples of the Unitrade listed wet printing. The first two stamps are the same reddish orange shade that Unitrade calls deep orange, but the stamp on the right is not particularly deep, being bright orange. It is very similar to the basic orange of the dry printings above, as is only identifiable as a #122b by virtue of the fact that it is a wet printing. Brownish orange - similar to orange, but with a hint of brown. Brownish orange - a slightly less intense example. I have included the orange shade in this group rather than the first because it is more similar to the other shades of this group than it is to the stamps in the first group, even though its name matches that of the first group. This hopefully should make the differences between these shades much clearer, although the difference between the first and third stamps is VERY subtle. Look at the scan for a few minutes and let your eyes adjust and relax. Eventually you will see the difference. I will be off on Monday next week, so my posts will resume on Tuesday. 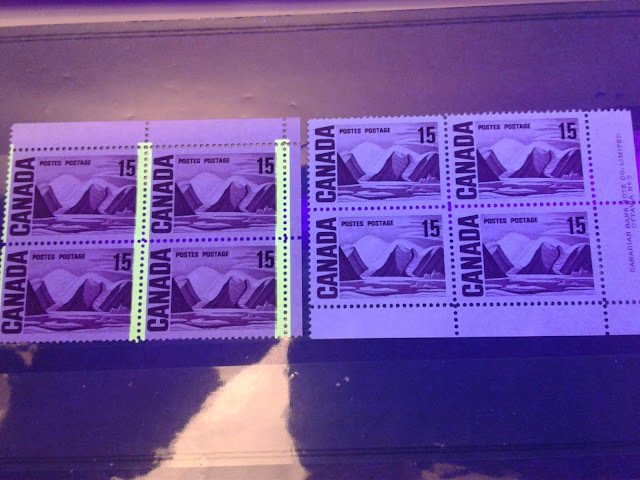 I am going to take a bit of a break from the Admiral issue and will write some more posts about stamp collecting in general, the market and collecting Canadian stamps before returning to the Admiral issue to write about its other technical aspects.